- words by Nick Feast. I started this project in 2000 with the aim of having a loco on the track in time for the 40th anniversary of the LCGB railtour of 19th March 1966, headed by 33006, which included a trip down the Lymington branch (Photo). I lived in Lymington at the time and travelled daily on the branch to school at Brockenhurst. When I started there in 1961 the branch was operated by Victorian 0-4-4 push-pull tanks; by the time I left in 1969 Ivatt tanks and Standard 4s had come and gone. We had few months of DMU's until the 'juice rail' was turned on, and the slam door electric units arrived, which are still running today. Although the 'Q1' was primarily a goods engine, the Southern and BR often used them on secondary passenger trains, and we did rarely get one on our morning school special. Although it was usually a 'Standard' class on this service, we also occasionally got a 'Q', and this was the basis for the 'Q1' design. When I was researching for the model, I noticed that the 'Q' class was quite similar in outline to the 'Derby 4F' and it turned out that Don Young's design would also make a good basis for a 'Q1'. I was able to get drawings and photographs from York that showed some minor differences in wheel spacing. The boiler was much larger on the 'Q1', in fact it fills the loading gauge completely. Don Young's design uses Joy valve gear whereas the real thing, both 'Q1' and '4F' use inside Stephensons valve gear. On a 3½" model it is just not practical to fit this in with inside cylinders and have reasonable bearing sizes. I know from constructing a 2" scale Clayton wagon that Joy valve gear works well, and many of the parts including the cylinder casting are the same as the '4F', the main difference being that everything is upside down in the wagon ! I had the frames laser cut and used the rear frame stay from the '4F'. The front stay/motion plate was ¼" steel, and the front buffer beam the usual steel angle. Large diameter cast iron buffers and stocks were sourced from Reeves, I think they were for the 'Schools' 4-4-0, as were the tender axle boxes and cast springs. Horns and loco axle boxes were as for the '4F' and built in the usual way. The drag box was a steel fabrication and brazed in place. A small sub frame was produced to support the steam brake cylinder, and this fits in behind the back of the ash pan. The major difficulty was sourcing wheels. The 'Q1' used a unique Bulleid Firth Brown steel wheel, similar in construction to the type used on the Bulleid pacifics. I have seen 'Q1' models built with the larger diameter pacific wheel but it is too large and spoils the proportions of the loco. Since there was nothing commercially available, I made a plywood pattern after taking measurements from the full size "C1" then in use at the Bluebell Railway. This was then filled with Isopon and varnished to give a smooth surface (photo). A local foundry cast six wheels and they were pleasingly realistic as the photographs show (photo). The Don Young '4F' has a boiler feed pump driven off the centre of the middle loco axle by an eccentric. I decided that this was a bit inaccessible, and in any case I wanted to incorporate a bit more inertia into the rotating masses for smoother and more realistic driving. By having a large central 'flywheel' the crank axle is also extremely rigid and slightly simpler to produce than the usual built up crankshaft (photo). A feed pump was fitted to the middle axle of the tender although the plunger diameter has to be rather small for it to work against boiler pressure, so it is less effective than a loco mounted one. This is not a problem if the injector is reliable, and that is not always the case ! The inside cylinders and valve chests were as the '4F' but cylinder bores were increased slightly to allow for the larger boiler that would be fitted. The Joy valve gear was copied except for the slides, which were made straight instead of curved. The same feature was included on the Clayton wagon and as I still had the jig for making the slide shaft it seemed to make sense. The slide shaft die blocks work hard on Joy valve gear, so the simpler the better. The oil tank is the full width of the frames behind the front buffer beam, and the oscillating LBSC style pump has a 1/16" shaft that protrudes through the left frame just ahead of the leading sandbox (Photo). An eccentric fitted to the leading wheel pretty much as in the full size drives a small roller clutch. Oil is pumped into the valve chest through a drilling in the cylinder block. A screw reverser was designed to fit onto the left side of the footplate, with the operating rod concealed behind the boiler cladding and arranged to line up with a dummy steam cylinder mounted in the correct position. A ball detent was fitted behind the brass hand wheel to hold the wheel in any set position, unaffected by any vibration coming up from the motion. The boiler design was loosely based on the '4F' but scaled up to incorporate the massive firebox. On the full size loco this was the result of using 'Lord Nelson' flanging plates to produce a grate over 8 feet long ! 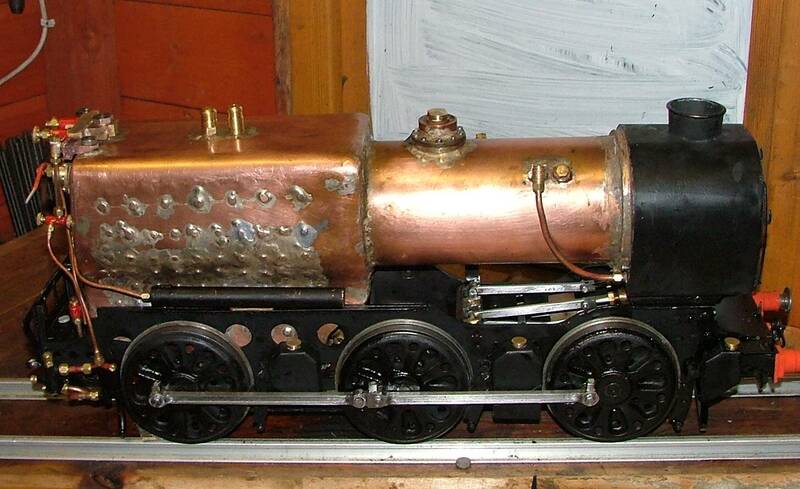 A short taper boiler barely longer than the firebox was used on the full size but for simplicity I used copper tube 3.75" diameter. There are two superheater flues 3/4" diameter, 3 large tubes 7/16" o.d. diameter and 9 tubes 5/16" o.d. diameter (Photo). The boiler back head slopes as on the full size, making the regular bush mountings rather interesting. A disc steam valve with two ports is fitted to give realistic response to the long handled regulator. The smokebox is a steel fabrication, which sits neatly on top of the valve chest, which acts as the floor. The smokebox door is retained as on the full size by clamping bolts on the rim, although these are 8BA not 2" ! The steam feed from the boiler is divided into two ¼" copper pipes which return directly into two concentric semi radiant superheaters. These feed into the steamchest one each side of the blast pipe. The blastpipe had to be fabricated from brass in order to bring it far enough forward to line up with the large diameter Bulleid chimney, and it resembles an 's' shape (Photo). After extensive track testing to maintain steaming under light loads, a 6mm blast nozzle and a 24mm throat diameter for the chimney seem to work well. A single nozzle blower proved inadequate so an annular ring with 3 jets of 1mm diameter each was constructed. There were several redesigns of the grate and ashpan. The final version incorporates a partial drop grate and longitudinal hopper doors, with air entry at the front and rear of the ashpan plus whatever gets in around the edges ! (Photo). The distinctive cladding is all mild steel sheet, some of it recycled computer casings that are easily worked, being rather soft steel. Removing the paint was a nuisance, but it is satisfying to think of obsolete electronic goods being recycled back into steam engines ! The short boiler barrel is insulated with glass mat and then clad with soft aluminium sheet. The barrel and firebox cladding are separate brazed assemblies bolted together. Two screws protruding from the back of the smokebox locate in keyholes on the front edge of the cladding and the cab is then screwed to two small lugs on the back of the firebox cladding. Both the cab and the tender sides follow the same curved profile and also match the profile of the pacifics and the Bulleid steel coaching stock. The curve on my model is slightly exaggerated whereas on the Hornby model it is not quite curved enough. The cab roof is removable although it is just possible to drive the loco with roof in place. The tender cab roof has to come off for driving, this was realised after the tender had been completed ! The tender body is steel, and is lined with Hammerite paint to protect it from rusting. I built the tender upside down and so had a brazed joint along the bottom of the sides on the outside. Had I built it from the bottom up this joint would have been concealed on the inside. A vertical hand pump is fitted in the tender, operated by a handle disguised as the water treatment filler cap (Photo). Serious pumping gives the suspension a hard time as most of the weight of the tender is carried on the centre axle to drive the pump and the pump is over the rear axle. Water capacity was increased by robbing some of the coal space, giving over 4 litres when full. Performance on the track has been very satisfactory with enough power to haul four adults including the driver on a substantial 7.25" gauge bogie trolley. On a good day 20 laps of the 1/3rd mile Bournemouth track can be completed, although to maintain pressure the fire needs to be deep and even. As soon as the loco is on the move the reverser can be wound right up almost to midway for running on level track, and the harder the loco is driven the more steam it seems to produce. The loco weighs in at 25kgs and the tender just 8kgs dry, allowing one-man transport without too much strain. The dummy sandboxes are filled with lead to improve adhesion, but on reflection even more weight could have been added to assist starting with heavy loads. There are a few frills to be added such as tender brakes, steps and brake pipes, but the model captures the look and to me the overall appeal of this great class of engines. To conclude, the loco performs better than expected, just needing a more reliable injector and a better driver to be absolutely brilliant !